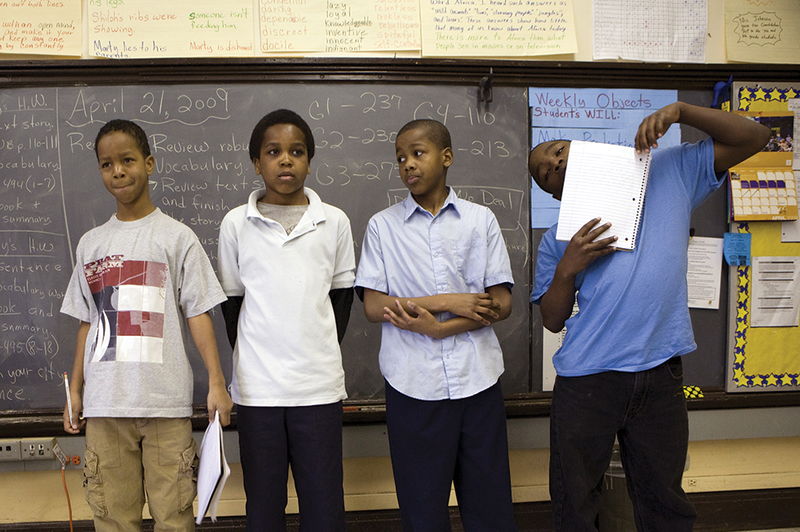 In this 2009 Catalyst photo, 6th-graders in an all-boys class at Ryerson Elementary on the West Side present their work to classmates. The principal created single-gender classes to improve discipline. Conventional wisdom suggests that suspensions are primarily a problem in high schools. However, the advent in the late 1990s of zero-tolerance discipline policies in Chicago Public Schools had a surprising effect: a steep increase in the number of elementary student suspensions. Between 1996 and 2003, elementary school suspensions rose from 34 per 1,000 students to 64. Meanwhile, as the district began in the early 2000s to push high schools to find alternatives to suspension, high school suspensions fell slightly, from 117 per 1,000 students to 94. As Catalyst noted in its May / June 2009 issue of Catalyst In Depth, studies have established a strong correlation between suspensions, course failures and dropping out. For one, suspensions keep students out of class, often leaving them behind. By 2006, CPS had officially scrapped its zero-tolerance policy in favor of a restorative justice approach, which encourages students to make restitution and reflect on their behavior in order to improve it. Yet by 2008, the number of suspensions throughout the district had nearly doubled from 2003. And racial disparities persisted: in 2008, one of every four African-American male students was suspended at least once. While district officials suggested the rise in suspensions merely reflected more accurate reporting, experts countered that schools still had strong incentives to under-report their suspension numbers. The shocking upward spike prompted local and national advocates to call for an investigation by the Office of Civil Rights in the U.S. Department of Education. Local youth advocates also launched a campaign pushing for federal and state policy to address excessive and disproportionate use of suspensions. By 2013, district leaders were trumpeting a 23 percent decline in suspensions within district-run high schools, but overlooked the fact that those high schools had seen an enrollment decline of more than 6,000 students. Meanwhile, enrollment increased at charter high schools, where CPS did not collect data on suspensions. At the same time, suspensions continued to increase in the elementary grades — even in pre-kindergarten and kindergarten, although the CPS Student Code of Conduct prohibits suspending such young students. Some good news arrived in the 2014 and 2015 school years — official numbers of suspensions dropped and a report from the Consortium on Chicago School Research showed that teachers and students felt safer as harsh discipline practices eased. On the federal level, the U.S. Department of Education teamed up with the Department of Justice to produce guidelines aimed at reducing suspensions and ensuring greater equity in school disciplinary practices — as the issues were national, not just in Chicago. Though advocates hailed the new law as an important step toward ending the “school-to-prison pipeline,” enforcing it will likely present challenges. A big hurdle is the scant resources available for training and supporting staff in restorative justice practices. In 2014, CPS revised its policies to prohibit suspending children in 2nd grade or younger, yet 368 kindergartners were suspended that year, including 55 for five days or more. Freelancer Maureen Kelleher's work has appeared in Education Week and the Harvard Education Letter. She was an associate editor with Catalyst Chicago from 1998-2006. Fro years, schools taught social-emotional learning on a piecemeal basis, but state and district policies have slowly moved to a more systemic approach. But low-income schools, where students could use the most support, have been largely left behind. Holding schools accountable for teaching these skills is tricky. Will Common Core spark improvements in adolescent literacy? When students don’t get higher-level reading skills in their middle and high school years, they often wind up in remedial college courses. The push for Common Core standards may be helping their teachers get better tools to take reading to new heights. Can history repeat itself and spark a parent revolution? Local school councils brought together parents across geography, race and class. But since they were created, parent organizing has been more fragmented. The current fiscal crisis could create a similar united front.